Why did the Giant Great White Shark (Carchocles megalodon) Become Extinct? The giant great white shark (Carchocles megalodon) existed as a species from ~23 million years BP until ~2.6 million years BP, and the evidence suggests this 60 foot monster preyed on whales. It was 1 of the many marine species to become extinct during the late Pliocene. Scientists believed megalodon was a warm water species and couldn’t survive cooling ocean waters that resulted from the emergence of the landbridge between North and South America. However, a brand new study determined climate change could not have been the cause of megalodon’s extinction. Map of megalodon fossil collection sites, dated over geological time periods. From the below referenced paper. If climate change didn’t snuff out megalodon, what was the cause of its extinction? The researchers who published this study suggest 2 possible causes: a reduction in whale species diversity, and competition with other predators. They note a decline in whale species diversity during the end of the Miocene is correlated with an apparent decrease in megalodon’s range distribution. This seems a plausible explanation. Many of megalodon’s favorite prey species went extinct, depriving the giant shark of food that it could efficiently feast upon. I’m not convinced competition with other predators was a factor in megalodon’s extinction. An extinct predatory species of sperm whale (Livyatan melvillei) likely fed upon the same prey species as megalodon. 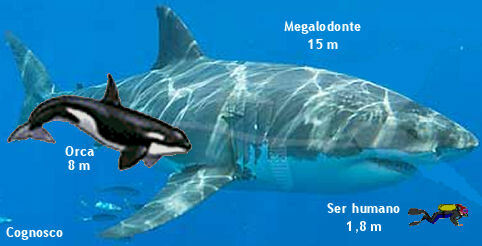 The ancestors of the modern day great white sharks (Carcharodon hubbeli) and killer whales (Orca sp. ), also may have shared the same prey items. However, megalodon co-existed with these species for millions of years, so I have a hard time accepting this explanation. Size comparison between megalodon, a killer whale, and a human. A pod of killer whales could’ve rubbed out a single megalodon. Perhaps this was a factor in their extinction. An extinct species of predatory sperm whale–Livyatan melvillei–probably competed with megalodon for the same prey. The extinction of megalodon may have shaped the evolution of baleen whales. Whales no longer had to be agile fast swimmers to escape megalodon, but instead could grow to a great size that enabled them to store food as blubber. The stored fat helped baleen whales swim long distances to warmer waters for breeding and calving. Killer whales, their lone remaining non-human predator, are less common in warmer waters, and whale calves have a greater chance of survival there. Every year, trillions of horny cricket frogs call to each other along the shores of ponds and slow moving streams wherever emergent vegetation grows. ( https://www.youtube.com/watch?v=QQirydJRs7Q )This is an ancient sound of nature. Many mighty mastodons heard these mating calls, and the small frogs occasionally were forced to jump, barely avoiding the heavy steps of the lumbering giants. The 2 far different species shared a preference for the same kinds of wetland environments. Old beaver ponds in the process of succeeding to wet meadows hosted the highest density of mastodons and cricket frogs. The beavers and mastodons opened the forest canopy allowing sunlight to reach plant growth along the pond margins–ideal hiding spots for cricket frogs. The seemingly insignificant cricket frogs outlasted the more spectacular mastodons because they are capable of reproducing at a much faster rate. Despite their annual abundance throughout North America for well over 5 million years, cricket frogs are recorded from just 10 fossil sites. According to the paleobiology database, the bones of cricket frogs have been identified from 4 sites in Texas, 2 in Nebraska, 2 in Kansas, 1 in Colorado, and 1 in Florida. Their remains are associated with Miocene fauna (25 million years BP- 5 million years BP) at 3 of the sites, suggesting cricket frogs have been around for quite some time. The amount of known fossil material for this genus compared with how many individuals lived during each generation is astonishingly low and is yet another example of how incomplete the fossil record can be. Southern cricket frog (A. gryllus). They also come in a green phase with a stripe down their back. Pine pollen washed into the pond just in time for the season’s first hatching of tadpoles. I wonder if the tadpoles feed on the protein rich plant food. I have seen ducks eating pine pollen. During late March pond margins in Georgia are filled with cricket frog tadpoles. Click to enlarge. There are 3 species of cricket frogs in the Acris genus: the southern cricket frog (Acris gryllus), the northern cricket frog (A. crepitans), and Blanchard’s cricket frog (A. blanchardi). Until recently, some taxonomists regarded these as 3 subspecies of the same species, but a study of cricket frog genetics determined there are species level differences between them. The southern cricket frog ranges on the coastal plain of southeastern North America; the northern cricket frog occurs from the piedmont region north to southern Canada. Blanchard’s cricket frog lives west of the Mississippi River, excepting 2 counties in Mississippi. This grand river serves as a barrier to the flow of genes, resulting in speciation among cricket frogs, spiny lizards, rat snakes, shrews, and some species of fish. The cricket frogs belong to the tree frog family (Hylidae), but their ancestors left the trees and inhabited pond margins instead. The adults eat insects, but during the tadpole stage, they primarily subsist on algae. I hypothesize cricket frog tadpoles feed on protein rich pine pollen. The tadpoles seem most abundant when pollen washes into ponds in early spring. A diet that includes pollen may increase the rate of tadpole growth and development, improving the odds of surviving to adulthood. It would be interesting to test this hypothesis. 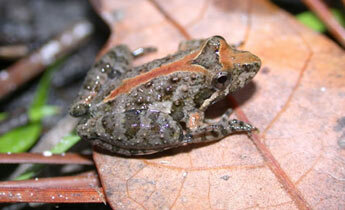 Southern cricket frogs do breed year round, but there is a peak during spring and a slow down during winter. Herons take a heavy toll of tadpoles and adults when they swarm near shore, and the frogs often fall prey to bass and catfish when the jump in the water to avoid the long-legged birds. Cricket frogs survive by constantly breeding, producing more frog than predators can catch and eat. Tags:Acris blanchardi, Acris crepitans, Acris gryllus, cricket frog fossil material, cricket frogs, do tadpoles eat pine pollen? An unpublished study of radiocarbon dates of extinct Pleistocene megafauna excavated from the Devil’s Den site in Florida produced unusually recent dates. Specimens from this site were dated to between 7,000 BP-8,000 BP; about 4,000 years after the time most believe these species became extinct. I often wondered why this data seemed to be ignored in the scientific literature and why no one had attempted a follow up study of the specimens from this site. The specimens were described in 1974, then seemingly forgotten. (See: https://markgelbart.wordpress.com/2012/07/08/the-devils-den-fossil-site-may-have-been-located-in-one-of-the-last-refuges-of-the-megafauna/ )Finally, several scientists began analyzing the Devil’s Den specimens again, and they just recently published their data in brand new journal named PaleoAmerica. Photo of the Devil’s Den site from inside the sinkhole. I had wrongly assumed the specimens were radiocarbon dated in 1974, but I learned from reading this study that they were dated in 1961 when radiocarbon dating was primitive and not particularly reliable. Moreover, the authors of this new study determined radiocarbon dating of these specimens could not be accurate because they didn’t have enough bone collagen left. They also suggest radiocarbon dating for most Pleistocene-aged specimens found in Florida is not possible because the regional environmental conditions eat away at bone collagen so rapidly. This poses a problem for scientists who want to know if humans overlapped in time with Pleistocene megafauna in North America. Surprisingly, there is little direct evidence of this, despite the universal assumption that they did. Human remains of confirmed Pleistocene age in North America are extremely rare. However, human bones associated with those of extinct Pleistocene mammals have been found in several sites in Florida including Vero Beach, Warm Mineral Springs, Melbourne, and Devil’s Den. Though this is suggestive, it’s possible humans buried their dead in the Pleistocene-aged strata, mixing the bones from different time periods. Scientists need something more definitive than association. Because radiocarbon dating can’t be used at these sites, the authors of this study decided to try rare earth element analysis on the specimens from Devil’s Den. Here is an explanation of rare earth element analysis. Rare earth elements (a bit of a misnomer because they’re not particularly rare) include elements on the periodic table numbered 57-71. They occur in groundwater in certain fixed ratios. Animals absorb ground water by ingestion and then for thousands of years after they die their bones continue to become saturated with it. Eventually, the bone reaches a saturation point and won’t take in any more. The ratio of rare earth elements in that particular fossil becomes fixed. However, over thousands of years the ratios of rare earth elements in ground water changes. So an animal that lived 13,000 years ago will have a different ratio of rare earth elements than an animal that lived 200 years ago. The authors of this study compared the ratios and concentrations of rare earth elements from specimens they categorized into 4 groups. 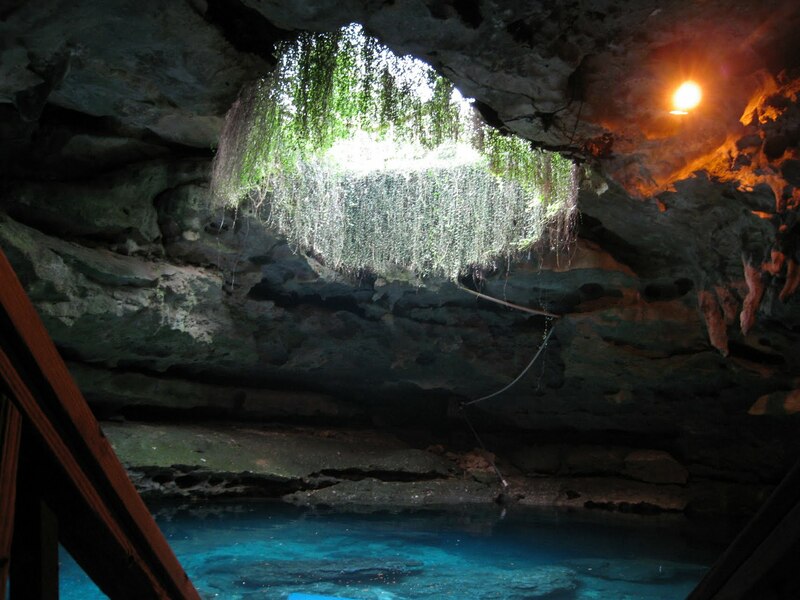 They analyzed 26 specimens from 5 different individual human skeletons found in the Devil’s Den sinkhole and compared them with the associated bones of extinct Pleistocene fauna, extant fauna thought to be of Pleistocene age, and extant fauna from the modern local environment. They used specimens of the Florida spectacled bear (Tremarctos floridanus), flat-headed peccary, Jefferson’s ground sloth, mastodon, and muskrat that were found in the sinkhole. The first 4 of these species are extinct, and this species of muskrat hasn’t occurred in Florida for about 3,000 years. The extant fauna thought to be of Pleistocene age found in the sinkhole included white-tailed deer, woodrat, striped skunk, gray fox, and gopher. Local fauna of modern age used in the study were deer, fox squirrel, gray fox, and gopher. Specimens from 4 of the 5 human skeletons shared similar ratios of rare earth elements with Pleistocene fauna, showing they lived during the same time period. One of the human skeletons is probably of Holocene age, but this study demonstrates without a doubt that humans overlapped in time with Pleistocene megafauna. The authors of this study assume 4 of the human remains are older than 13,000 years old, but they have no way of knowing for sure. The rare earth element analysis shows these individuals lived at the same time as Pleistocene megafauna, and the bones are of great antiquity, but the date of deposition is not known. As I’ve written previously on this blog, I hypothesize some species of Pleistocene megafauna survived in small relict populations well past their accepted terminal extinction date of ~12,500 BP. The exact extinction dates of Pleistocene megafauna in Florida will remain a mystery, especially if radiocarbon dating can’t be used. The false gharials, a type of crocodylian, were widespread throughout the world during the Miocene between 25 million years BP- 5 million years BP. They inhabited the coastal regions of Eurasia, and North and Central America when worldwide climate was warmer than it is today. With their long snouts and rows of sharp teeth, they were well adapted for catching the fish that abounded in salt marshes and saltwater lagoons. Fossil evidence of false gharials has been found along the eastern seaboard of North America from Florida to as far north as New Jersey. Gaviolosuchus americanus is the species that lived in eastern North America during the late Miocene, while G. carolinensis occurred here during the Oligocene (33 million years BP- 25 million years BP). 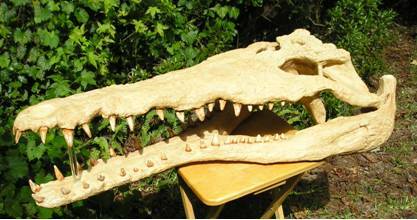 The false gharials likely arose as early as the Eocene. 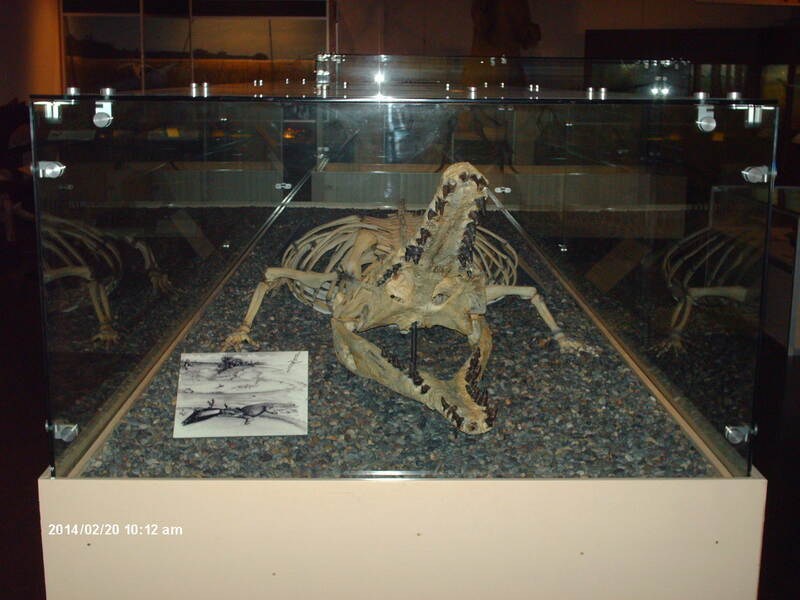 Skeleton of Gavialosuchus carolinensis on display at the Charleston Museum. This species lived during the Oligocene. Skull of Gavialosuchus americanus. Note the long snout. Some scientists use the scientific name of Thecachampus americanus instead of Gavialosuchus americanus. Scientific nomenclature is a tedious topic, so I won’t delve too deeply into it on my blog. The first scientific name ever given to a species holds precedence. Paleontologists often find fossil material they mistakenly think is from a new species, and they will give it a name. Later studies then determine the “new” species is actually the same as a species that had already been named. The older species name is accepted as the correct one. The dispute between the usage of Gavialosuchus americanus and Thecachampus americanus has yet to be unanimously resolved. Gavialosuchus americanus was a little larger than the sole surviving species of false gharial–Tomistoma schlegeli. The extinct species grew to 18 feet, surpassing T. schlegeli by a couple of feet. T. schlegeli survives today in parts of Malaysia and Indonesia, but they’ve been extirpated from Thailand. They mostly eat fish but will opportunistically take monkeys, deer, birds, other reptiles, and humans. The only species of false gharial still extant–Tomistoma shlegeli. Various species of false gharials occurred along the coasts of Eurasia and North America from the late Eocene to the early Pliocene. Anatomical studies suggested the false gharials are distantly related to the true gharial (Gaviatis gangetives) of India. The long narrow snout of the false gharial was considered an example of convergent evolution when unrelated or distantly related organisms evolve the same adaptation to similar environments. However, a genetic study determined the false gharial and the true gharial are closely related sister species. The vertebrate zoologists were wrong. Gavialosuchus americanus co-existed with a species of alligator in North America. An analysis of chemical isotopes in the bones of both crocodylians suggests they occupied different habitats. The false gharial of America inhabited saltwater environments and alligators ruled the freshwater lakes and streams. Harshman, J. ; et. al. Smilodon populator may have been the largest cat ever to have hunted in the wild. Richard Farina, a South American paleontologist, estimated this species reached a weight of over 800 pounds. 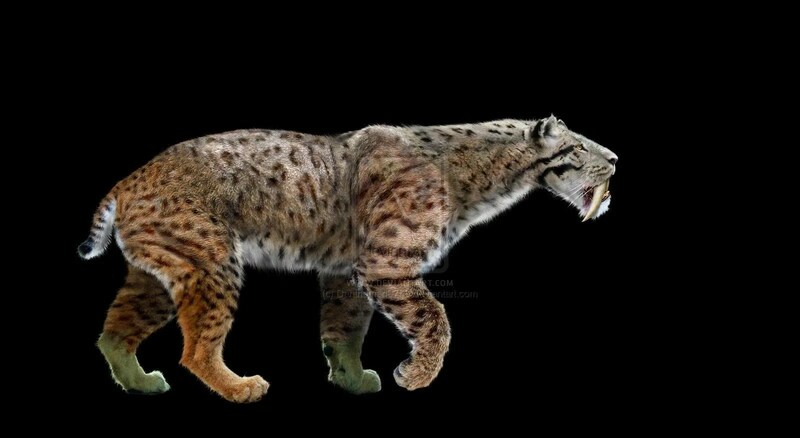 This is more than twice as big as the more famous Smilodon fatalis, a species that lived all across North America during the late Pleistocene. Smilodon fatalis also ranged into South America west of the Andes Mountains, while S. populator occurred east of this mountain chain. Apparently, the Andes Mountain chain served as a geographical barrier, resulting in the evolutionary divergence of the 2 species of Smilodon. Smilodon populator reached an astonishing 800 pounds in weight. S. populator was an ambush predator that wrestled its prey to the ground and bit its throat, slicing through windpipe and jugular with its long fangs. Scientists assumed it lived in forested environments where it could more easily surprise its prey from behind cover. However, a recent study, using isotopic analysis of bone collagen from sub-fossil specimens, determined S. populator and its favorite prey lived in an open dry environment. According to this study of specimens from 6 different sites in Argentina, S. populator’s favorite prey was macrauchenia, a now extinct primitive ungulate. Macrauchenia occupied an ecological niche similar to that of a modern day giraffe’s. With its long neck it could reach tree leaves unavailable to horses and deer, but it also grazed on grass. S. populator also often preyed upon 2 species of ground sloths–the enormous megatherium and lestodon. Prey species other than macrauchenia, megatherium, and lestodon made up less than 5% of S. populator’s diet, if this isotopic analysis accurately reflects the big cat’s diet. Giant ground sloths moved so slowly that S. populator would likely have had no problem seizing an individual. I suspect they mostly attacked weaned sub-adults, no longer protected by their mothers. Full grown sloths would have been difficult to subdue because they were large, powerful, armored under thick skin, and armed with big claws. Some scientists believe ground sloths dug burrows as a kind of strategy to defend themselves from S. populator. These burrows still exist. (See: https://markgelbart.wordpress.com/2012/10/10/some-giant-ground-sloths-dug-long-burrows/ ) A ground sloth in a burrow with its back protected would have been impossible for a Smilodon to kill. I hypothesize S. populator had a black or dark gray coat that made it difficult to see in the dark. This allowed them to ambush sleeping macrauchenia in the open. It explains how a large relatively slow predator could catch a better runner, like macrauchenia. I believe S. populator hunted ground sloths during the day when they left their burrows to feed and sleeping macrauchenia at night when the latter were less alert. An isotopic study suggests macrauchenia was Smilodon populator’s favorite prey. An extinct canid, Protocyon trogl0dytes, may have competed with S. populator. The isotopic values of 1 specimen of this species closely matches those of the many specimens of S. populator analyzed in the study referenced below. This suggests Protocyon ate the same prey species as S. populator, however, the sample size is too small to reach a definite conclusion about this species diet. It’s not known whether this species was an active hunter, a scavenger, or both. Isotopic evidence from a single specimen of a jaguar from the late Pleistocene of South America indicates it preyed on different species–horse, deer, and rodent. S. populator lived in South America for at least 750,000 years. It ecologically replaced a saber-toothed relative of the marsupials known as Thylacosmilus atrox. Smilodon may have outcompeted Thylacosmilus and driven it to extinction. However, there is a 1 million year gap in the fossil record between the most recent specimen of T. atrox and the earliest specimen of S. populator. It’s not known for certain whether the 2 species ever overlapped in time. In the conclusion of the below referenced paper the authors suggest a change from dry open environments to more humid forested conditions may have contributed to the extinction of S. populator. I strongly disagree with this notion because a) S. populator survived as a species for over 750,000 years of climatic changes and b) dry open environments are still widespread in South America, most notably in the Gran Chaco region. Smilodon populator hunted in a dry open environment, not dissimilar from this palm savannah in the Gran Chaco region of Argentina. I’m convinced man is entirely responsible for the extinction of S. populator. Humans overhunted Smilodon’s favorite prey, depriving the big cat of food, and probably directly hunted the big cats. Its great size became a disadvantage after man colonized the region because it was an easy target to hit with spears thrown from a great distance. I visited the Great Smoky Mountains National Park a few years ago and left greatly disappointed. I had hoped to see an abundance of wildlife. Instead, I saw a grand total of 1 squirrel, 4 Canadian geese, and 6 crows. My daily constitutional in my neighborhood yields a greater variety of wildlife than that. It was depressing to discover suburban Augusta, Georgia offers better wildlife viewing opportunities than a famous national park. There are 2 areas of the Great Smoky Mountain National Park where wildlife watching is recommended–Cades Cove and the Cataloochee. However, when I visited, the road to Cades Cove was closed. The access road to the Cataloochee is a single-lane unpaved path winding up a steep mountain without guard rails. I judged it far too dangerous to continue up this life-threatening hazard. The National Park service should be ashamed of the sorry infrastructure here. It’s like something one would expect in a Third World country. In a National Park, good wildlife viewing shouldn’t be confined to just a couple small areas. Wildlife should be abundant throughout the park. The problem with the Great Smoky Mountains National Park is the hands-off management policy of the park service. A dense old growth forest covers most of the park. This is poor habitat for most large mammal species, and it supports very low wildlife populations. An attempt to re-establish red wolves in the park some years ago failed because there was nothing in the park for them to eat, showing just how low wildlife populations are here. Red wolves can live off rabbits-the park doesn’t even have many of those. Moreover, this park, wrongly thought to be natural, is like nothing that ever existed in nature prior to ~1900. Native Americans, beginning about 14,000 years ago, set fire to the woods every year. This created a mosaic of habitats including open woodlands and grassy prairies. Large centuries-old oaks and chestnut trees were widely spaced with luxurious grasses and flowers growing in between. Before man colonized the region, large herds of megafauna maintained a similar landscape. I propose that the National Park service transform Great Smoky Mountains National Park into a Pleistocene park by actively managing it to improve habitat for wildlife. After a detailed study they could install a management plan that would recreate an environment more similar to that of the Pleistocene than that of today’s aberrant abomination. Some old growth forest would remain standing, especially along creeks and rivers that serve as natural fire breaks. But most upland areas would need to be clear cut in some places and thinned out in others. Pasture grasses and native flowers could be planted and large mammal species such as bison, horses, and llamas could be introduced, so that the open environment could be maintained by their foraging and trampling. A fire management plan would also maintain this environment. Eventually, Siberian tigers could be introduced to control the population of large ungulates. Tigers would also cull wild boar and bears. A functioning Pleistocene-like ecosystem would be far more interesting and worthwhile than the park as it currently exists. If the petition gets 100,000 signatures by May 2, 2016, the White House will write a response. President Obama has shown little interest in the environment, since he’s been in office. He has not called for the establishment of more protected wilderness lands, and he’s thrown wolves under the bus by taking them off the endangered species list. I am curious how he would respond to this. I’m sure he will defer to the Park Service party line. The National Park Service won’t like my proposal. I believe their policy, though they would never admit it, is to keep wildlife populations as low as possible, so they don’t have to bother with problematic human-animal interactions. U.S. Fish and Wildlife recently chose to delist grizzly bears as a threatened species. This will allow redneck states, such as Wyoming, to reduce the overall population of grizzly bears. (See: http://www.grizzlypeople.com/topten.php ) These jerks want to maintain a population of 500 grizzly bears by killing 50 per year. If there were only 500 humans left on earth, and 50 were killed every year, humans would rapidly become extinct. A non-profit organization in Russia has already established a Pleistocene Park located in Yakutia, Siberia. Surgey Zimov hypothesized the extinction of the Pleistocene megafauna caused the transformation of a steppe grass environment in northern Asia to willow shrub tundra. Twenty years ago, he spear-headed an experiment to reverse this transformation. His organization bought tundra land and introduced horses to an enclosed area. They helped the horses along by converting this land into pasture. At first many horses were killed by wolves or died because they ingested poisonous plants. But the horses have learned not to eat the harmful plants, and they have proved capable of surviving the deep snows that some thought would doom the whole herd. The experiment supports Zimov’s hypothesis because the horses (with a little initial help) have transformed willow shrub tundra to grassland in their enclosed living space. The grassland is similar to what existed during the Pleistocene. Pleistocene Park in Siberia. The introduction of horses led to the transformation of tundra shrub to grassland habitat in areas where the horses are enclosed. 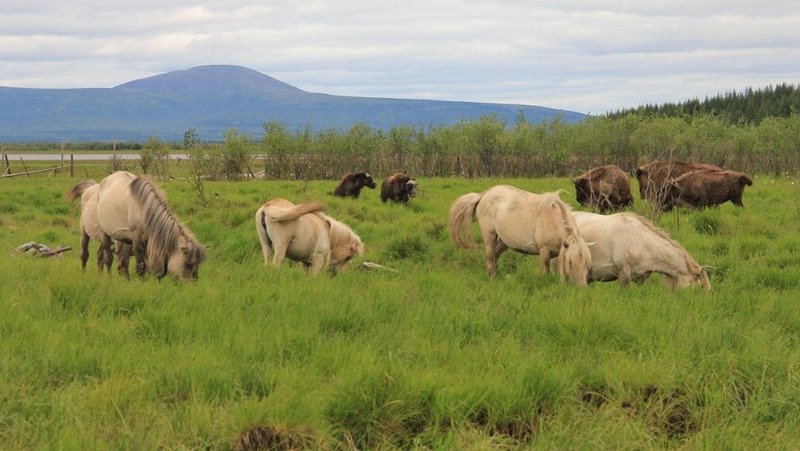 Caribou, bison, moose, elk, and musk-oxen have also been introduced. (A small population of the former already occurred here.) Caribou are now the most abundant ungulate in the park. Researchers hope the moose browse down the willow shrub, so that more grazers can be introduced on a larger scale. Introduced elk escaped from an enclosure, but some found there way to the park without human help. The list of potential future introductions includes Bactrian camels, saiga antelopes, yaks, asses, Siberian tigers, and cloned woolly mammoths. A secondary discovery of this experiment determined the conversion of willow-shrub habitat to grassland mitigates the effects of climate change. The hard compacted surface resulting from horse trampling keeps the permafrost intact. Siberia is too far to travel. I want to see a Pleistocene Park established within driving distance of my house. Please sign my petition. You are currently browsing the GeorgiaBeforePeople blog archives for April, 2016.